Parents: Dare to be Creative! Creativity is about problem solving, experimenting and taking risks, writes teacher, mum and director of Creative Play Central Elise Ellerman. I OFTEN hear parents say that they “don’t have a creative bone in their body”. Parents are creative. As a parent you are often forced into a position where you have to be creative; many parents can tell stories about the ways in which they have had to fashion an origami style outfit out of whatever they had on hand because of an unforseen accident. Children are instinctively creative – they are curious and this gives them the desire to explore, discover, learn and engage in creative pursuits. To learn more about Creative Play Central, contact Elise Ellerman on 0407 143 163, visit the website and you can also hop onto their Facebook page! Most of us know of someone, or have had the experience of having to “think outside the box” when it comes to creating a picture perfect birthday cake that isn’t quite going to plan. Then there’s the times when we need to create a “big boy” or “big girl” room and the budget means that we have to be very creative. Creativity is about problem solving, thinking laterally, experimenting, taking risks, discovering new ways of doing things and developing new ideas. Children are instinctively creative – they are curious and this gives them the desire to explore, discover, learn and engage in creative pursuits. As parents and carers we need to nurture children’s creativity as it is essential for their well-rounded development. Providing children with many and varied activities that encourage them to think in creative ways lays an excellent foundation for future success in learning. Engaging children in creative experiences develops transferable skills that lead to children being innovative and flexible thinkers. 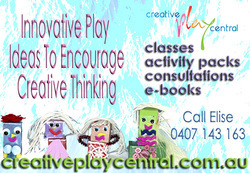 At Creative Play Central, a fast-growing Brisbane based business, we educate parents and carers about fun and playful strategies to use to encourage creative thinking in their children. We teach parents and carers about different ways they can use common materials and play experiences (such as blocks, drawing, painting and play dough) in different ways to inspire their children to “think outside the box”. "As a parent you are often forced into a position where you have to be creative"
Providing children with experiences that requires them to think in creative ways involves using stimulus and an open ended task for them to express their own ideas. Stimulus materials might involve altering the canvas for drawing or painting, for example, instead of using a blank sheet of paper; inspire your child to create something totally different by offering a completely new experience with a different canvas. Changing a canvas could involve cutting out some coloured door shapes, securing them (one edge only so they can be opened) to the paper. Invite your child to draw what they think could be behind the door. Another idea could be to cover a shoe box with white paper, then cut some random shapes out of the box (in various sizes) and secure something like honeycomb mesh (available from craft stores) or any sort of material that can be used for threading purposes over the cut out holes (children can thread feathers, pipe cleaners and other bits and pieces into these spaces. Older children could also thread beads and buttons onto the pipe cleaners). Incorporating a new element such as threading into a drawing or painting on a box is sure to get the creative juices flowing. At Creative Play Central we provide several services (detailed on our website) to assist parents and carers implement creative play ideas. We offer “Creativity to the Rescue Packs” which contains all the materials children need to enjoy six open ended activities that have been designed to inspire children to use their imaginations. We also present seminars throughout the year on a range of topics, create personalised presentations for groups, produce e-books for individuals as well as consult with parents and carers to create tailor made creative play experiences to meet children’s needs and interests. To learn more about Creative Play Central, contact Elise Ellerman on 0407 143 163, visit the website and hop onto their Facebook page! "Providing children with experiences that requires them to think in creative ways involves using stimulus and an open ended task for them to express their own ideas "
Elise is mum to three children and teacher is the founder and owner of Creative Play Central. Throughout Elise’s ten year teaching career she was passionate about designing creative and innovative lessons that challenged her students thinking and inspired them. Elise was appointed a Deputy Principal for the last three years of her career. Elise witnessed firsthand the difference a creative approach can make to the wellbeing of a child and their academic success. As a mum to three children aged five and under , Elise is driven to create original and creative opportunities for her children to play, create and learn. To learn more about Creative Play Central, contact Elise Ellerman on 0407 143 163, visit the website and you can also hop onto their Facebook page! What's the Key To Kindy? There's No Place at Kindy! Do You Want Nanna's Advice? Water Safety Starts with you Mom! Don't You Just Hate it When This Happens? What can Online Games do for Kids? Spot the Puppy and Win! Babies Make Pals Before Talking! Oh Oh! My Baby Understands Me! Mum I'm Bored! Fun Games for Kids! Is Yours a Fast Food Baby? "Many parents, say experts, simply don't know what's needed most to prepare their kids, socially or academically, for kindy"
_WHEN David Brookefield of Chapel Hill, Brisbane came home from his first day of kindy a year ago, his mum was keen to hear about his experiences. But she was disheartened when the first thing the little boy said was, "How do I make friends?" "It never occurred to me that he might not know what to do," said mum Natalie. "I should have told him to say something like 'Does anyone here like BenTen?' Basic social skills - like how to start a conversation and ask people questions - were the things that really worried him." 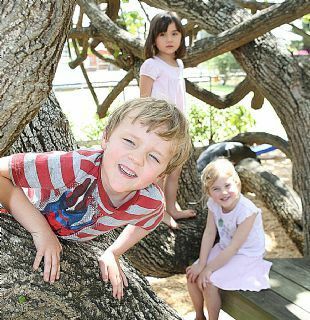 Many parents, say experts, simply don't know what's needed most to prepare their kids, socially or academically, for kindy. That can be frustrating for moms and dads, kids, and teachers. Children need a broad range of experiences From such eye-openers as museums to fun activities like combing the seashore for shells, broadening your child's world is a smart move. "The more kids are able to experience by the time they get to kindergarten, the easier it will be for them to learn and build upon what they're learning," says Laurie Marple, a kindergarten teacher in Davenport, IA. 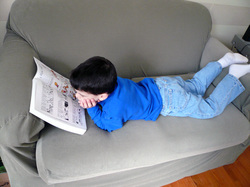 Diverse activities can also help increase vocabulary. "One of the best predictors of a child's later success as a reader is the size of her vocabulary when she begins school," Hyson says. Helping your child explore her corner of the world will provide her with the chance to learn new words associated with visits to zoos, forests, lakes, stores, libraries, and so forth. What to do: Even young kids can get something out of a trip to an art or science museum, whether it's seeing the difference between watercolor and oil paintings (then wanting to create both at home) or understanding that some animals sleep during the day and play at night. Go fishing or to a sporting event; call the fire department or police station to arrange a tour. Take a trip to the zoo, a local animal shelter, or a farm. Head to a gardening store and talk about plants and seeds, then buy some to grow together at home. Visit a pet store to buy tadpoles, put them in a fish tank, and watch them develop into frogs. "These simple activities aren't things a parent necessarily thinks of as wonderful experiences, but to a five- or six-year-old who's never experienced them before, they're fascinating," says Paquette. Social skills -- listening, taking turns, sharing, following directions -- are vital. If your child doesn't know how to make friends or borrow things, she won't be able to share classroom materials with her peers. If she can't follow three-part instructions or sit still for the 20 minutes it takes to do a project, she'll lag behind. And any student who's struggling not to speak out of turn will have trouble focusing on the lesson. What to do: It takes time and practice for a 5- or 6-year-old to learn to pay attention and not poke her neighbor. Kids in group daycare or preschool have some experience with taking turns and cooperating; others can learn through summer camp or art, sports, or music classes. At home, role-play. "How do you ask to borrow something? What if a kid says no? Being prepared for situations like these will help your child get through the day," says Tracie Paquette, a kindergarten teacher in Satellite Beach, FL. Teresa Savage, author of The Ready-to-Read, Ready-to-Count Handbook: How to Best Prepare Your Child for School, suggests a game of Lids and Bottles to help a short attention span grow. "Collect peanut butter jars, shampoo bottles, or other containers. Put the lids in one box and the jars in another. Ask your child to match the lid to the correct bottle," she says. To encourage following directions, play Simon Says. Good teachers strive to make classes fun, so what your child does in school may seem like play. But the work children do really is important for learning. A picture, for instance, is rarely just a picture, says Paquette. "It's about listening. Did the child draw what he was told to draw? Sometimes we talk about shapes: What shape is a house? Can you draw that?" Singing songs subtly introduces kids to memorization, rhythm, and tempo, all of which will come in handy for learning reading, math, and science. Something as simple as cutting and pasting can hone fine motor skills, as well as teach such lessons as patience and how to follow instructions. What to do: Start now by sharing with your child your excitement about all the Big Kid things that he'll be doing. "Eagerness to learn is at least as important as knowing specific facts and skills," says Marilou Hyson, Ph.D., associate executive director for professional development at the National Association for the Education of Young Children. In the fall, help him understand the importance of school by being involved yourself. Contact your child's teacher before the first day (many schools will already know who it is) and ask how parents can assist in the classroom.